"Time is muscle", these are the most important words that I remember from my cardiology lessons at the medicine faculty. These words are related to the benefit for patients of an early diagnosis of acute myocardial infarction. Nowadays, 1/3 of the deaths worldwide are due to cardiovascular diseases (CVD). Beginning this year, a part of public awareness is on CVD and CVD prevention. Popular attention in Belgium and France is focused on the quest of "pushing out" from public places the smokers and limit the exposition to tobacco, an important risk factor for cardiovascular diseases. Professionally there is a real challenge for the diagnosis industry to develop early markers of cardiovascular diseases detection. Some markers (Myeloperoxydase, Choline, CD40L, protein S100B...) will be available on automated analyzers by the end of the year and will give us new diagnosis possibilities for the early diagnosis of CVD and stroke. This concern gives us the opportunity to have a short overview about CVD nowadays and to underline the actual campaign of WHO against CVD. The WHO Programme is concerned with prevention, management and monitoring of CVD globally. It aims to develop global strategies to reduce the incidence, morbidity and mortality of CVD by reducing CVD risk factors and their determinants, developing cost effective and equitable health care innovations for management of CVD and monitoring trends of CVD and their risk factors. CVD family members included hypertension, coronary heart disease, cerebrovascular disease (stroke), peripheral vascular disease, heart failure, rheumatic heart disease, congenital heart disease and cardiomyopathies. 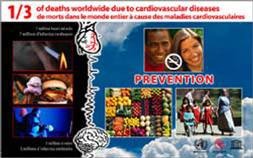 CVD made up 16.7 million, or 29.2% of total global deaths according to World Health Report 2003. 7.2 million are due to ischaemic heart disease, 5.5 million to cerebrovascular disease, and an additional 3.9 million to hypertensive and other heart conditions. More than 50% of the deaths and disability came from heart disease and strokes, which together kill more than 12 million people each year. According to the American Heart Association (AHA), stroke is the third leading cause of death in the United States, resulting in 275,000 deaths annually, and is a leading cause of adult disability. The AHA estimates that in 2005, the direct and indirect costs associated with stroke in the United States will exceed $56 billion. At least 20 million people survive heart attacks and strokes every year; many require continuing costly clinical care and are candidates to develop heart failure. Around 80% of CVD deaths took place in low and middle-income countries. Economic transition urbanisation, industrialisation and globalisation bring about lifestyle changes that promote heart disease. Life expectancy in developing countries is rising sharply and people are exposed to these risk factors for longer periods. Newly merging CVD risk factors like low birth weight, folate deficiency and infections are also more frequent among the poorest in low and middle income countries. By 2010, CVD will be the leading cause of death in developing countries. In many countries, too much focus is being placed on one-on-one interventions among people at medium risk for CVD. A better use of resources would be to focus on those at elevated risk and to use other resources to introduce population-wide efforts to reduce risk factors through multiple economic and educational policies and programs. These risk factors include diet and physical activity. The dietary intake of fats, especially their quality, strongly influences the risk of CVD like coronary heart disease and stroke, through effects on blood lipids, thrombosis, blood pressure, arterial function, arthrogenesis and inflammation. Excess salt has a significant impact on blood pressure levels. The WHO strategic plan for CVDs. Reduce major CVD risk factors and their social and economic determinants through community-based programmes for integrated prevention. Development of standards of care and cost-effective case management for CVD. Global action to enhance the capacity of countries to meet the health care needs of CVD. Developing feasible surveillance methods to assess the pattern and trends of major CVDs and risk factors and to monitor prevention and control initiatives. Developing effective inter-country, interregional and global networks and partnerships for concerted global action.